The cheque imaging topic is a key area for discussion currently. Our 3rd Annual Cheque Imaging and Remote Deposit Capture Seminar hosted by the TALL Group and our cheque scanner partners Digital Check Corp. 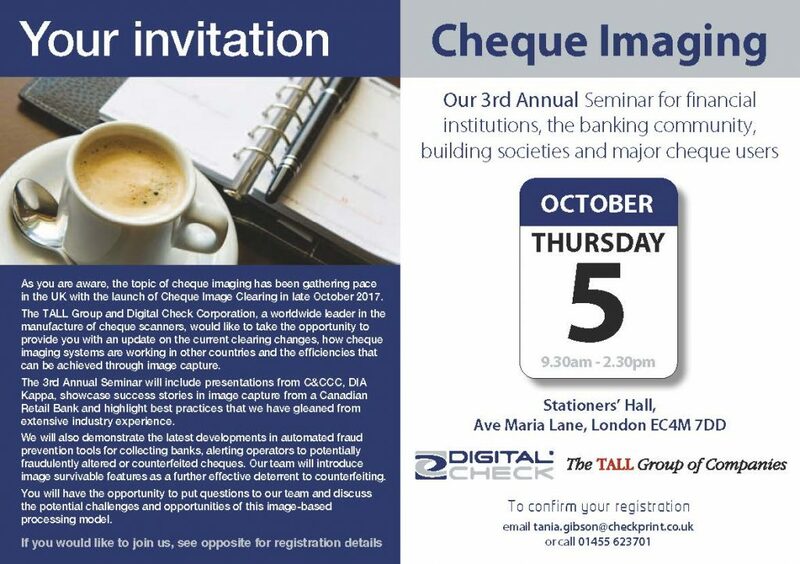 This event for financial institutions, building societies, agency and challenger banks will offer the latest information on cheque imaging prior to the launch of the UK image clearing system at the end of October 2017. This is the third of an annual event highlighting the advent of cheque imaging in the UK and the experience of partners around the world where cheque truncation has been introduced. The introduction of the faster cheque clearing system based on cheque imaging, and not the exchange of the original paper document as now, involves the creation of a completely new payments system – it is not a simple overhaul of the existing clearing process. The complexity of the project, coupled with there being many financial organisations that need to come together to deliver this technological leap-forward for the cheque, means that there will be a phased introduction rather than an industry-wide launch from day one. The new system will go live with certain banks and building societies from 30th October 2017. Then, at some stage in the second half of 2018, all of the UK’s banks and building societies will clear all cheques via the image-based system to the faster timescale. The precise date as to when this will happen will be announced by the industry in due course. Banks and building societies will also advise their customers at the appropriate time regarding their individual roll-out plans.